Ayn Rand Contra Human Nature: Objet d'Art of the Week: "Beginnings"
Objet d'Art of the Week: "Beginnings"
In which the ARCHNblog takes a regular look at the products of Rand's aesthetic theories. This post is completely impertinent (in every sense). Whatever one thinks of Bokor's work, it is not a "product of Rand's esthetic theories." It's a product of Bokor. Artists influenced by Rand have produced works of varying degrees of quality. The only art that was a direct product of Rand's esthetic theories was Rand's. I myself am sympathetic to Rand's esthetics, and I think Bokor's painting is ridiculous. I know many Objectivists who think the same thing. Bad painting. But to be fair, this is a very bad example from the gallery. I have a very low opinion of Rand's writings on aesthetics, but some of the artists that are featured at Cordair Fine Art Gallery are very talented. Cheap shot. I understand what she was trying to do, and I respect her attempt. The execution leaves something to be desired though. If I was an artist, and it were my painting; I would have included a few people between Imhotep and Aristotle, a lot of people between Aristotle and Ayn Rand, and some people after Ayn Rand. Maybe then I would have finished it off with a mathematician, a computer scientist, or a physicist. I got it right away that Ayn Rand is at the top, Aristotle directly beneath her, and below him is an Egyptian scribe, but I was confused about why Bokor would include three members of Neil Young's Crazy Horse at the bottom. Is she really into 70's rock? Then I read the parenthetical comment under the painting. It's a prehistoric artist, a Neanderthal, and a Homo Erectus. Doh! The issue is not that this particular image is bad, though of course it is. The issue is that there is so much like it in Objectivist art, and so little that is much better than it. "Artists influenced by Rand have produced works of varying degrees of quality." But he's not kidding anyone. Because just about all Objectivist-influenced art, where it even exists, is "varying" in degree of quality between mediocre or worse; and there is almost none that is excellent, let alone important or epochal in any way. Quality is the exception, not the rule. We also observe the same effect in Objectivist attempts at literature, so we can hypothesise a common cause: Rand's theories. Rand is after all one of the most widely publicised philosophers ever; additionally, unlike so many modern thinkers her philosophy is founded basically on two aesthetic works. So it can hardly be a question of the obscurity of her vision, or lack of passionate devotion in her followers. Yet despite all this, in the 50 years since "Atlas Shrugged," what in art or literature has Objectivism actually produced? Contrast this vacuum, typified by the type art you see here, with the vast amount of essays, conferences, websites, schisms, internal politics, and misc blab that her philosophy churns out annually. Despite its foundations, Objectivism is effectively aesthetically sterile. Thus there seems to be a massive, often overlooked theory/practice disconnect here. And a picture or two is worth a thousand words to illustrate the problem. Sylvia Bokor's art is still better and more honest than any ARCHN 'analysis'. Barnes dishonesty lies in *not* examining Objectivist art in order to claim he has some fact as to its absence. Worse, he presumes that any who seek to adhere to the philosophy should somehow also be artistic geniuses. Such anti-intellectualism posing as intellect is filth... worth no further remarks. I would also add that 50 years is a drop in the bucket as far as intellectual movements are concerned. One could argue that Rand's ideas have more influence today than at any time since the 50's and 60's. Also, how can you neglect the band Rush? The drummer and lyricist, though not a full-fledged Objectivist, credited the group's breakout album to "The genius of Ayn Rand." Beyond that, their lyrics have some of the most beautiful and thoughtful themes in modern music. Look up/listen to songs like Freewill, Good News First, Faithless, Missions, Prime Mover, Subdivisions, and Force Ten. 30+ years of commercial and critical success is no small achievement. 50 years is a truckload of time, particularly in the mass media age that was fully rolling by the time Rand was writing. Consider:"Das Kapital" (1867) +50 years=1917. In art or literature, a dozen entire movements can easily take off in that time. >One could argue that Rand's ideas have more influence today than at any time since the 50's and 60's. What, aesthetically? I hardly think so. Where? If you mean politically, I don't see the movement as being any bigger or more significant than it was in the '60s. If you mean economically, there is certainly a great deal of more general agreement with Rand's view of capitalism today than there was back then, and this is indeed a good sign. As to whether she can take much credit for it, it seems far more likely to be due to forces like Friedman's critique of Keynesianism etc. But that's wandering off topic, which is why a movement that is founded on aesthetics is so markedly lacking in them. My oft-stated hypothesis is that Objectivism is basically scholastic and verbalist in form; hence, it becomes about talking, rather than doing. (One is always sharpening one's pencil but never writing anything, as Popper puts it) This becomes particularly clear once we lift our eyes above the vast output of philosophical blab about virtues such as "productivity" and "achievement", and all the screeds against other aesthetic styles, and see what the movement itself has actually produced and achieved in the last half century. As Peggy Lee once said:"Is That All There Is?" The Journal of Ayn Rand Studies is one significant development. Tara Smith's book was the first scholarly treatment of Rand's ethics. The Anthem Foundation provides grants to schools who want to include her writings in their curriculum. Clearly, her work is making headway in academia. The point is that Rand's ideas are far from dead. Has there been an earth-shattering renaissance of Objectivist art? Nope. I can't argue you there. But as mentioned, Rush has made an incredible contribution to art based on individualism and self-awareness. Furthermore, they've sold tens of millions of records across a span of 30 years and played concerts to over 100,000 people at a time. If short stories and novels could follow that lead (without being shameless ripoffs of Atlas Shrugged), I'd be pretty proud of that output. It hasn't happened yet, but it could. I think that's an interesting point. My personal theory is that because Atlas and the Fountainhead were such distinct, influential works of art, people have difficulty breaking that mold. Their stories, essays, and creations tend to look and feel just like those books. Instead, artists need to channel their love of passion and individualism in their own style. When I want Rand, I'll read Rand. A new twist on this theme is what is necessary, I think. Ron Paul is a Christian and is (moderately) right-to-life. More importantly, he is a libertarian and was the 1988 Libertarian Presidential candidate. Rand despised libertarians and the Libertarian Party, and said so again and again and again. And Cong. Paul’s views are utter anathema to the official Objectivists today: they criticize Dubya for not having killed enough Muslims and for not (yet) having attacked Iran. Cong. Paul’s central issue is ending US government intervention abroad; he is the exact opposite of a modern movement Objectivists. To describe Ron Paul as an example of Rand’s influence would be like describing Pope Benny XVI as a sign of Rand’s influence! Don’t get me wrong – a couple weeks ago, I sent a hundred bucks to Dr. Paul. And, I even like Pope Benny XVI, despite my being an atheist. The point about “Objectivist art” is not that a small movement has thus far not turned up any Rembrandts. The point is that Objectivism does not seem to have attracted already successful artists to the movement, just as it has not attracted a significant number of successful scientists to the movement. Prima facie, this is odd. “Atlas Shrugged” would superficially seem to be a manifesto tailor-made for creative artists and brilliant scientists. It has not worked out that way, now has it? If “Rush” is the best you can do, all I can say is that “Rush” is not Bach (or Beethoven or Wagner or…). Again, we see the pattern of Marxism repeated – although I thought that Bokor’s painting was even worse than most of the Stalinist “socialist realism” I’ve seen. I’m not very picky about paintings – but I was shocked: that was really bad. Jay, maybe you already know this, but after 10,000 yrs of Mankind's failure to recognize Reality, the full potential of reason and individualism, let alone capitalism, 50 yrs IS a drop in the bucket. "50 years is a truckload of time, particularly in the mass media age that was fully rolling by the time Rand was writing. Consider:"Das Kapital" (1867) +50 years=1917." Barnes knows full well that Marx was "singing to the choir". Barnes knows that needs no explanation, but is too carefully dishonest to allow so obvious a point to interfere with his agenda. "As to whether she can take much credit for it, it seems far more likely to be due to forces like Friedman's critique of Keynesianism etc." Wherein he ignores the many businessmen who acknowledge Rand for helping them see that their actions were morally proper (even if they made moral mistakes along the way). And Jay, do not fall for the Libertarian absence of principle. Ron Paul may be influenced by Rand, but he and his colleagues are anathema to the fundamental principles of capitalism, individualism and above all reason and reality. a movement that is founded on aesthetics to which you deign to respond, without getting at the fundamental. Art speaks to one's sense of life through expressions of the artist's philosophical value judgments. Rand developed her ideals in order to create a timeless work of art. Whether uninformed or deliberate deception, Barnes's premise is that fundamental philosophy is divorced from aesthetics. Given that Rand went to considerable lengths to explain how honest introspection shows otherwise, Barnes demonstrates the same concrete-bound, anti-conceptual thinking found in any Biblical literalist (his big words do nothing to change that fact). Barnes is willing to work really hard to appear to be using reason to deny reason. In effect he is trying to position himself as a new Immanuel Kant who sought to destroy reason with 'reason. At least part of Kant's con was to tell his audience he had something positive to offer. Jay, repeated argument from non-essentials, by omissions, and by misrepresentations is not argument, it is dishonesty. Your honest study of Objectivism, and some of the other related materials such as those by Tara Smith will show you that Barnes is not merely misguided, or a little dishonest. His efforts are an evil in the same vein as Kant. I know full well that Ron Paul is not an Objectivist and runs contrary to many Objectivist principles. My sole point was that Ayn Rand's writings have undoubtedly cleared the way for libertarians and made a noticeable difference in American politics. Dave, I never said Rush was on par with Bach. But in the last 100 years or so, who has been? And Rush is not small potatoes, they are one of the biggest and most famous bands in the last 30 years. They helped pioneer the entire genre of progressive rock. All I said was, "It's a start." >Prima facie, this is odd. “Atlas Shrugged” would superficially seem to be a manifesto tailor-made for creative artists and brilliant scientists. It has not worked out that way, now has it? This is the key point to ponder. After all, Objectivism is very "productive" of some things: specifically, conferences, websites, schisms, internal politics, websites, denunciations, hagiographies, endless audio lectures etc. There is a truckload of that stuff! All of which makes theories as to some kind of collectivist social repression of Rand's ideas somewhat incredible. It's hardly as if they were samizdat under the Soviets, or Marx having to flee Europe. The implication is simply absurd. What we're seeing in Objectivism is, in short, that it is highly productive of unproductive activity. This poverty is most obvious in its aesthetic output, but when you look at it closely, it runs deeper. Objectivist Epistemology, supposedly its crowning insight, has not in fact advanced past the Introduction some 40 years back. The situation, which I sometimes call Objectivism's "failure to thrive" I now attribute to genetic, not environmental factors. The lack of expansion in Objectivist epistemology knowledge probably has something to do with the ARI doctrine that Objectivism is closed and nothing can be added to it. This is unfortunate, and I suspect that as Peikoff, Binswanger, etc. fade that may change. At least, I hope it does. An updated look at Objectivist epistemology from a neuroscience and psychological perspective would, to me, be fascinating. Even if it invalidated some of Rand's points. >An updated look at Objectivist epistemology from a neuroscience and psychological perspective would, to me, be fascinating. Even if it invalidated some of Rand's points. >Jay, maybe you already know this, but after 10,000 yrs of Mankind's failure to recognize Reality, the full potential of reason and individualism, let alone capitalism, 50 yrs IS a drop in the bucket. Wow! Think of it! All those fools like Charles Darwin, Tom Edison, Albert Einstein (not to mention those idiots Archimedes, Euclid, and Aristotle) exhibited a “failure to recognize Reality” until the Spirit of Reason gave birth to the Savior of Mankind, the great Ayn Rand (well, really, Alice Rosenbaum). Do you have any inkling of an idea of how foolish your statement sounds to any educated human being? Do you know anything about intellectual history at all? Do you understand that almost none of Rand’s ideas were original, that she cut and pasted from earlier thinkers? Does it really seem plausible to you that every single human being for “10,000 yrs.” exhibited a “failure to recognize Reality…”? Everyone: I hereby present my case that Objectivism is a bizarre religious cult. Or at least it will when it stops laughing – you can’t refute a logical genius like mbram, but you can certainly get a few chuckles. Just wait till Leonard Peikoff puts it all together with the DIM Hypothesis. Another leap in being. > The situation, which I sometimes call Objectivism's "failure to thrive" I now attribute to genetic, not environmental factors. Yes, almost everyone here, including Jay, acknowledges that the environmental factors (e.g., Peikoff) have not been good. But the cultishness goes back to Rand herself. And defining Objectivism as “the philosophy of Ayn Rand” helps push Objectivists to constantly worry over what Rand thought instead of what is objectively true. If Rand (and her leading followers) had possessed enough knowledge of intellectual history, she could have avoided the cult of personality and announced that the time had come to wed Lockean empiricism, Aristotelian eudaemonism, natural rights theory, etc., to restore the Enlightenment and revive the best thought of the Greeks. As a restoration project, a new Renaissance of the insights into reality that had already been painfully discovered over the millennia by human beings, but almost lost in the murderous twentieth-century revolt against the Enlightenment, Objectivism could have been a force for good. I suspect that in her heart of hearts, Rand may have known that this was all she was doing, that her philosophy was not really original with her. But by evading that central fact and encouraging her followers to evade it, she has produced this monstrously evil cult whose official leadership is now actively calling for mass murder. Frankly, I’m less sanguine than Greg about the insignificance of the Objectivists. They’re nobodies now, but so was Lenin in early 1917. They’re fanatically, insanely loyal, as the Bolsheviks were. Give them an emergency, as the Russian collapse in World War I provided to Lenin, and they might actually be able to take power. If that happens, the current bloodthirstiness demonstrated by the movement’s leadership suggests that the human species might pay very dearly. The current official leadership of the Objectivist movement are not sane, decent, normal human beings. >Rush is not small potatoes, they are one of the biggest and most famous bands in the last 30 years. They helped pioneer the entire genre of progressive rock. All I said was, "It's a start." Jay, Rand did not promise “a start.” Objectivists allude to Tara Smith, Rush, etc. to demonstrate that Objectivism has not been 100 % barren. Indeed. Tara Smith appears not to be a moron: I disagree with her on some issues, but she seems to be an academic philosopher of normal intelligence and competence. But, Rand did not promise that Objectivism would lead only to a tiny handful of doubtful achievements that are not much worse than the products of the general culture at large. Her slogan was not “The New Intellectuals – not much worse than what we already have!” Her call was for New Intellectuals that are much, much better than the cesspool, as she put it, of contemporary culture. That has not happened. There cannot even be a serious pretence that it has happened. In terms of what Rand envisioned, Objectivisim has indeed been 100 % barren. Nothing, nothing at all, of lasting value in the terms that Rand herself defined in the intellectual or cultural spheres has come of Objectivism. >My sole point was that Ayn Rand's writings have undoubtedly cleared the way for libertarians and made a noticeable difference in American politics. No, Jay, that is not “undoubtedly” the case. Do you know anything of American intellectual history in the 20s, 30s, and 40s, before Rand became a significant figure? Literary figures such as Albert Jay Nock, H. L. Mencken, Garet Garrett, Henry Hazlitt, Isabel Patterson, and Rose Wilder Lane (the so-called “Old Right” intellectuals) had been raising high the banner of individualism, freedom, capitalism, and limited government before anyone knew of Rand. The Austrian school of economics – Mises, Hayek, and their students such as Murray Rothbard – had already been showing that socialism could not run an industrial economy and that government intervention in the financial system (as carried out by Rand’s pal Mr. Greesnpan – thanks, Al, for the subprime debacle!) caused crises and depressions before Rand published anything. Have you read any of these people? If so, you know that Rand was just one figure in that much, much broader movement and that she was not one of the more original or insightful people within that movement (Mises, Hayek, and Rothbard obviously knew much more economics than Rand; Garrett had much more profound insights into American history than Rand). I suppose there may be a few Americans who are semi-literate and who managed to read Rand but couldn’t handle serious writers. But to think that it was “undoubtedly” Rand who “cleared the way for libertarians” betrays a woeful lack of knowledge of American history. And of course, there were also a few earlier figures, such as Thomas Jefferson, John Locke, etc. whom educated people knew about long before Rand was born. I’m beginning to think that this is one of the key problems with Objectivism – Objectivists are so insulated from intellectual history that they can really believe the bizarre lies about Rand’s seminal importance in human thought. There are a lot of interesting thinkers in American history. Try reading some of them. Thanks to the folks in Irvine such as Peikoff, I think it's more likely that Objectivism will survive as a relic, like Comtian churches in Brazil. Absolutely. As an Objectivist I'm glad this site exists. I don't agree with everything but the discussions and posts are extremely eye-opening and fun. Will respond to Dave later, gotta go for now. That's one terrible painting. It made me laugh out loud. If I'd been drinking coffee, I would need a new laptop now. On the other hand, the original retails for $14,000 and is listed as "sold." That's a pretty fair chunk of change for a 2' X 3' painting by an unknown artist. Somebody must like Bokor's work - a lot. I agree that some of the other artwork on the site is better, but it's still discouraging to see the same trite themes showing up again and again - skyscrapers, railroads, industrial projects, Greco-Roman nudes. There seems to be a barrenness of imagination in terms of subject matter. I suspect this is because the artists, hampered by Objectivist doctrine, do not want to risk painting anything that could be criticized as "irrational" or "anti-man." So they stick to pre-approved subjects, much in the way that the literature profs at that Objectivist college are restricting their courses to books and plays that Rand already evaluated. >So they stick to pre-approved subjects, much in the way that the literature profs at that Objectivist college are restricting their courses to books and plays that Rand already evaluated. Yes, it's Founders College Syndrome. I looked around, on that site. Some of the works of art are truly good. Just idle speculation. Artists that actually are good tend to have their own philosophy anyway. They are not disciples of other philosophers. They certainly are not the disciples of the literary executers of other philosophers. It's possible that the better artists on the site just happen to like to paint that way. Not only have I read Jefferson, I have visited his personal estate at Monticello. I will repeat what I have said in other posts: I do read authors and subjects other than Rand/Objectivism. I am not an intellectual one trick pony. No, Rand was not the first intellectual to make headway for individualism or capitalism. What she was the first to do was justify them on moral grounds persuasively to millions of people who might not be acquainted with the thinkers you named. My own enjoyment of Rand's work has led me in many directions: including this blog, whose primary purpose is refuting her! Here is just one article brimming with quotes from successful businessman (people who do things, as Daniel Barnes always admonishes Objectivists to do) who credit Rand for inspiring them to succeed. Now, I will grant you that a good deal of Objectivists probably do insulate themselves from other intellectual pursuits. But this is not the way it has to be and not every Objectivist is like that. I really think that after the "old guard" at the ARI fades, Objectivism will improve as a movement, to the extent there is a movement. >I do read authors and subjects other than Rand/Objectivism. I am not an intellectual one trick pony. "Here is just one article brimming with quotes from successful businessman (people who do things, as Daniel Barnes always admonishes Objectivists to do) who credit Rand for inspiring them to succeed." This issue isn't whether or not Rand inspired anyone to succeed. No one here denies that some of Rand's writings can be quite inspirational. No, the challenge of this thread for Objectivists (as opposed to people merely inspired by some of the ideas she championed) to explain why there haven't been any Objectivist (even non-ARI sanctioned-self-identified Objectivist) artists, writers, or composers who have been as innovative and influential as such non-Objectivists Dmitri Shostakovich (Communist, but not quite by his own free choice), Steve Reich (Orthodox Jew), Philip Glass (Tibetan Buddhist), John Coltrane (mystical Christian), John Zorn (Jew), the Beatles (Beatle-ists? )or Beck (Scientologist) (I just had to throw that one in here). I'm just naming my faves, of course. Now - it would be ridiculous to claim that these composers and musicians owe their greatness to their ideologies. While they were undoubtedly inspired by these ideologies, they owe their greatness to the fact that they studied, practiced, learned, push-and-pulled against the confines of tradition, and most importantly, worked. Meanwhile, all I've seen from the Objectivist camp (and Rush doesn't count because while they were inspired by Rand, they don't even self-identify as Objectivists ... maybe because of Piekoff's silly lawsuit against them) is reams and reams of sniping, know-nothing criticism of pretty much all post-Romantic musical innovation. So you're telling me that Beck is a significant example of artwork but Rush isn't? Rush, who has dwarfed Beck in record sales and dedicated their entire breakout album to "the genius of Ayn Rand?" The band whose lyricist called the Fountainhead "absolutely critical" to his formation? Look, I'm not saying the dearth of Objectivist art doesn't leave something to be desired. But if freaking Beck counts, then so does Rush. As I said, people just need to break the same old skyscrapers/railroads/Greek statues mold that another commenter alluded to. The power of Rand's own fiction seems to make people afraid to deviate from it. If/when this occurs, I predict there will be a rise in worthwhile Objectivist art. Not to knock Rush, but bands like Nirvana have similar total record sales. For Christ's sake Kenny G has sold more albums than Rush. Anon, you are right. My sole point in mentioning Rush is that their songs have inspired and brought enjoyment to millions of people in a way that might not have occured were it not for Rand's work. I found it relevant to the discussion about the (lack of) Objectivist art. Jay - I think you misunderstand me and in turn, I misunderstand you. I didn't say that Rush doesn't count as being musical/artistic innovators (I'd be foolish to say so ... while I'm not especially a fan of their music, I can appreciate it, and they truly pioneered what we now call Prog Rock), nor did I say that they weren't inspired - even directly so - by Rand. I said they didn't count as Objectivist innovators because as far as I know they don't even identify themselves as such. Rand was directly inspired by Frank Lloyd Wright ... his architectural innovations were the basis for Howard Roark's, but it would be foolish to imply that her accomplishments were somehow his or belonging to the school of Modernist architecture because he was her inspiration. In general, I think the whole idea of art being of or serving any -Ism* will result creative sterility as the artist will tend to self-censor, avoiding methods, themes, and topics that might be misconstrued as un- or anti-Ismy. This is what happened in the Soviet Union with Socialist Realism since artistic norms were decided upon and dictated from above by non-artists, and I think this explains why there hasn't been much creative output from Objectivism where Rand and then Peikoff dictated what was and wasn't acceptable art. This dearth of creativity may be, and probably is changing, with the plethora of non-ARI groups springing up that seem to treat Rand's ideas as stepping stones and springboards, rather than inert, immutable Truth. * by -Ism, I'm referring to ideological -Isms, not -Isms related to specific artistic movements such as Surrealism, Modernism, Cubism, etc. Tho' it's worth noting that even the pioneers of those artistic movements usually move beyond them since they eventually limit the creativity they once inspired. "I didn't say that Rush doesn't count as being musical/artistic innovators (I'd be foolish to say so ... while I'm not especially a fan of their music, I can appreciate it, and they truly pioneered what we now call Prog Rock), nor did I say that they weren't inspired - even directly so - by Rand. I said they didn't count as Objectivist innovators because as far as I know they don't even identify themselves as such." I would say that Rush can't possibly count as Objectivist innovators because official Objectivism would not recognize their music as music. Mozart was "pre-music," for Christ's sake, so Rush would have to be classified as noise, trash, or the mindless, inarticulate grunting of filthy, savage, Kantian hippies. Btw, the Bokor painting is bad by Objectivist standards. The image shows Rand with a bit of a furrowed brow, which, by Objectivism's simplistic methods of interpretation, means that Bokor thinks that thinking, creating and existing are painful, thankless tasks. The fact that Bokor would dare to shown Saint Ayn displaying such discomfort reveals that Bokor is downright evil. The painting would only qualify as being great if Rand were shown writing while leaping through the air and just bursting with glee. Bokor should be denounced and excommunicated, and her name should be stricken from the collective Objectivist memory. The point is that Objectivism does not seem to have attracted already successful artists to the movement, just as it has not attracted a significant number of successful scientists to the movement. That observation interests me a lot. I admit to having expected, when I'd moved to NYC and then, the last week of November '68 and in subsequent months, began meeting Objectivists, that the Objectivist world would be one of artistic and intellectual ferment, that there would be many who were good at artistic endeavors and others of a creatively exploring disposition, persons in the sciences, philosophy, literary studies who were eagerly questioning and extending boundaries, the boundaries of Objectivism as well as of their respective fields. I was not only surprised but dismayed to find that for the most part what Objectivists seemed to be questioning was how good of Objectivists they and their friends were, how to improve themselves as Objectivists, and how correctly to understand and apply the Objectivist texts (a large percentage of those I met hardly read any other texts). Later I began to think that I hadn't been astute in my expectation, that probably persons attracted to Rand's writing who really were of a creative type would have soon been warned off by exactly the sorts of aspects which prevented me from thinking of myself as "an Objectivist." 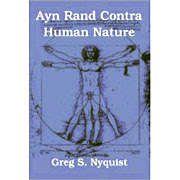 An important for instance was the lack of any critical response in the Objectivist publication. I'd subscribed to the Newsletter in mid-'63 and acquired all the back copies to then. I felt from the start the oddness of the lack of discussion, of critical reply, even of any mention of potential problems. I thought, well, they might be publishing on a shoestring, they're trying to present their ideas, they don't have room for give-and take. Still, I would have expected at least alerts to issues they found questionable and in need of work. Another negative sign for me was all the talk of how "a rational person" thinks, acts, responds. Nathaniel Branden did this quite a bit in his articles as well as AR, and I thought that as a psychologist, shouldn't he know that this was a method of intimidation not of encouragement to personal growth? Also, among the three taped courses I took when I was still going to school at Northwestern and I enrolled for some of the courses offered in Chicago was a course called something like "A Critical Overview of Psychological Theories." (The other two courses I attended were the ones on "Basic Principles" and "Basic Principles of Objectivist Psychology.") I was a psychology student, planning at that time to go on to an academic career in research psych. I had no love of Behaviorism, could see a great deal wrong with Behaviorism myself. But even on a really negative view of Behaviorism, I thought that Nathaniel was caricaturing rather than fairly presenting. And I figured, just from details of his descriptions, that he was doing likewise with clincal theories of which I didn't know as much. Also, in general I thought that a huge amount of caricaturing was characteristic of presentations of the history of thought in the Newsletter (later The Objectivist). All in all, I would come to think after I'd begun to meet Objectivists that there'd been signs on the basis of which to anticipate the prevailing conformity, and to expect that the kind of creative ferment I'd anticipated wouldn't be there to be found, that instead the creative people, even if interested by Rand, would soon have gone off and "done their own thing." I think you guys are missing the point here and taking everything seriously in a manner that would have made Ayn Rand proud. She was the queen of being entirely humorless after all. See, when you can laugh at your intellectual opponents when they do something silly, it makes life alot lighter and pleasanter. I think the basic problem here may go beyond the cultism I'm always complaining about to Rand's underlying idea of forming an intellectual/cultural "movement" which she did seem to really believe in and which she described, for example, in "For the New Intellectual." Suppose I'd become a dyed-in-the-wool Objectivist. I'm a pretty bright guy as judged by standardized tests, the schools I went to, the fact that I have a Ph.D. from Stanford in physics, my holding a few patents etc. But I would not have ended up being a brilliant light on the advertising sign for Objectivism -- I do not have a Nobel Prize, I haven't been elected to the National Academy of Sciences, etc. The problem is that most of us physicists are pretty bright guys, but there is simply no way to plan, train, recruit, or anticipate real brilliance of the sort exhibited by Einstein, Maxwell, Newton, etc. Unless Rand had managed to recruit most of the bright physicists in the country, she probably, simply as a result of the laws of chance, would not happen to have recruited the real John Galt. Sadly, she seemed to really believe that Objectivism would produce a lot of John Galts, Hank Reardens, etc., but those guys produce themselves, they are not churned out by a movement. As you suggest, a situation in which being in a movement is a central part of one's self-identity tends to mean that you spend your time thinking about whether you’re a good “movement” person (i.e., a “real” Objectivist), rather than focusing on your own creative work. But even if Rand had figured out a way to avoid this counter-productive aspect of any tightly integrated, demanding movement, Objectivism still would not have produced very many geniuses because geniuses are very rare and are basically self-produced. The weird thing is that Rand the novelist seemed to know this. Yet, as philosopher, she allowed herself to say silly things such as that the proof that John Galt could really exist was the fact that she and Nathaniel Branden existed! I suspect that even Nathan now finds that quote more than a little embarrassing. One of the sad things, of course, is that a quite a few Objectivists who could have been perfectly good Eddie Willers have convinced themselves that they are really John Galts, which, I think, may explain a great deal of the nonsense now peddled in the name of Objectivism – Peikoff’s and Harriman’s crackpot ideas about physics, the widespread idiocy about math and cosmology prevalent among Objectivists, etc. As a physicist, I’d be extremely pleased to reach the level of achievement of my own mentor, Richard Feynman: but, of course, to true members of official Objectivism, that would make me a failure, since Feynman has, I understand, officially been labeled a “D1” by Peikoff’s pal Harriman! And that shows how warped the Objectivist judgment of human achievement is: if Richard Feynman is to be denigrated despite his very substantial intellectual achievements (not just his Nobel Prize), where does that leave most Objectivists? Jay: "I never said Rush was on par with Bach. But in the last 100 years or so, who has been?" Actually, this is not a fair comparison. Sure, maybe no one in the last years 100 years is quite on par with Bach (although Mahler, Sibelius, and Elgar come awfully close), but that doesn't mean there weren't a lot very excellent composers during this period (especially in the first half of it). Indeed, the years 1907 and 1957 mark a sort of highwater mark for art music, at least in terms of amount of first-rate music that was being written. Now any comparison between Rush and art composers of the 20th century is unfair to both sides of the equation. It would be like trying to compare Stephen Foster with Brahms and Wagner. Foster was a great popular song writer, whereas Brahms and Wagner were great art music. composers. When Rand talked about an artistic renaissance, it's doubtful that she had in mind a renaissance in pop art. That would assume that pop art was in the dark ages in the fifties and sixties, which was clearly not the case. I'm not even sure such terms make sense in the context of pop art, since whatever is popular is going to be regarded as good, regardless of whatever people with more fastidious tastes might think. Adn I thought that Stalinist Realism was kitschy- the Objectivist painters actually make Social Realists seem examples of good taste. The banality and the kitschiness of this gallery left me gawking at first and laughing out loud afterwards. Dave, you have a point about too many Objectivists making their lives about "the movement" and not themselves. I don't know why I never fell into that trap, but others clearly do. They could do well (in my view) to use Objectivism as a tool for reaching their own chosen goals and not an ever-growing yardstick they need to measure up to. It doesn't mean they can't be passionate about Objectivism's virtues and conclusions. I think I am, but I don't wake up and think "How can I be a better Objectivist today?" That thinking, it seems, is more on par with a religion than a secular, rational philosophy. I don’t like to diss still-living artists who are probably sincere, work hard and have achieved only modest success. But I am bound to agree with this judgement. The problem with ‘romantic realism’ as a genre is that the realism becomes undercut by the romanticism. Since everyday life is too 'unromantic', the artist tends to revert to stylised and idealised subject matter and style. In effect, these works are the modern-day descendants of the Academic style, but without that movement’s imagination or technique. What is notable about these works, among other things, is the generic content, a result I would say of the Academic insistence that a work of art should embody a concept. In addition is the emphasis on the pleasant over the painful. So we have maidens – unclothed or draped in gauzy rainment -- gazing wistfully into the middle distance, and bearing titles such as “Garden Solace”, “An Awakening Mind”, “Dream Flight”, “Serenity” and so on. The result is kitsch which lacks the tension of conflict. The feeling in these artworks has been anodised, rubbed smooth, to become soft and ‘sweetly’ melancholy, monuments to ‘good taste’. And ironically, the figures are types, devoid of real individuality. But if any of the artists were to ask me what I thought of their work, I would answer honestly that I enjoy it. They put a lot of effort into these works. It doesn’t hurt to praise them for what they are, journeyman art -- the equivalent of a Mills and Boon romance. Give them time! I mean in 150 years time works by Objectivists will be hanging in the Tate and the louvre won't they? I mean it took 200 years for Kant's (evil) influence to be felt in art so just you wait. You'll all be laughing on the other side of your faces in 2160. Zombie thread, back from the dead! I've always been amazed how so much objectivist art bears a striking visual similarity to Soviet Realism. It's uncanny! "Beginnings" has that Soviet vibe to some extent, but is perhaps closer to a "Watchtower" cover.